William Ivan Wellons died on February 11, 2018 at his home, surrounded by his family. He was born, September 1, 1928 to the late Harvey Bryant Wellons and Eula Boyette Wellons. 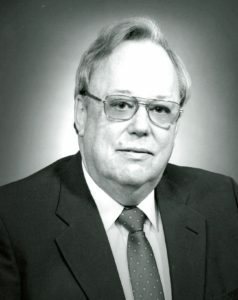 William retired as the Johnston County Executive Director of the Farm Service Agency in 1996. He was a member, Deacon, and Trustee of Princeton Baptist Church and served as Chairman of the Princeton School Advisory Board for many years. He was also active in the Princeton Lions Club and member and past master of St. Patrick’s Lodge Number 617. Funeral services will be conducted Wednesday, February 14, 2018 at 11:00 a.m. at Princeton Baptist Church officiated by Pastor Dwayne Batten and Pastor Dennis Pollock, with burial to follow at the Princeton Cemetery. The family will receive friends on Tuesday, February 13, 2018 from 7:00 to 9:00 p.m. at Princeton Baptist Church and others times at the home. William was married to the late Dorothy Thompson Wellons and is survived by their children, W. Bryant Wellons and wife, Kim; Chloe Wellons; and Mark A. Wellons and wife, Mary. In addition, he is survived by his three grandchildren, Megan Wellons Lee and husband, Matthew; Mandy Wellons Dimpsey and husband Stephen; and Daniel Ivan Wellons and two great-grandchildren, William Matthew Lee and Mary Kyle Lee. William is also survived by his very special niece, Duane Haddock, husband, Tony and their children. In addition to his parents and wife, William was predeceased by his sister Jean Wellons Wright. Flowers are welcome or memorial contributions can be made to the Princeton Baptist Church Building Fund at P.O. Box 215, Princeton, North Carolina or to the William I. and Dorothy T. Wellons Community Service Scholarship c/o the Johnston County Education Foundation at P.O. Box 1075, Smithfield, NC 27577. Condolences may be sent to the family at www.parrishfh.com.